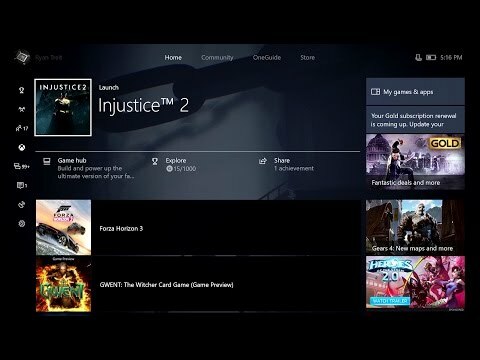 Major Nelson has posted a video preview of the new update currently rolling out to Xbox One. In it he highlights the changes coming to Xbox One including Arena for Killer Instinct, updates to the LFG, Clubs and the Parties feature. - Starting today there will be a new tab titled 'Tournaments' in the Game Hub for Arena Titles. - You will be able to see upcoming Tournaments for that game. - Receive Tournament notificitions on your console, mobile or Windows 10. - Create your very own custom Tournaments and participate in other user-created Tournies. - Participate in Tournaments or arrange new ones specifically designed for clubs that you run/a member of. - Receive Notifications of followed friends LFG posts and notify them of yours. - Share LFG posts to your Activity Feed. - New Beam Tab to showcase live streams from members of your club. - Admins can filter what streams will be permitted in their clubs based off of specific game titles or age rating. - Add an on-screen overlay that highlights those who are talking in a party - great for identifying new voices you may not be familiar with. - Position it on the screen in any corner/side and change the transparency.